The most frequent questions I get asked as an artist are about my tools and supplies. People want to know what brands I like, how I get certain effects, what my preferred surfaces are for working on, and where I get these items. I've put together a list of most of the items that are found in my studio, and links to where I usually acquire them myself. I hope you find this useful, and if there are items I forgot to include or aspects of my technique you have questions about, feel free to email with your requests. For years now, Winsor & Newton Series 7 Kolinsky Sable Watercolor Brushes have been my goto as far as quality watercolor brushes are concerned. While they do cost more than most brushes, I find that they have an excellent point, which is extremely durable and lasts many times longer than brushes that I might purchase for cheaper. 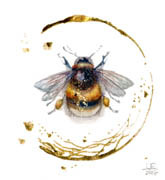 When painting fine details in both my fantasy artwork, and most especially in my botanical paintings, they are an absolute must. This isn't to say that cheaper brushes are not also extremely useful to have in your toolkit. I pick up brushes on sale at my local art stores to use in the rougher techniques and treatments where I don't require a fine tip. My most frequently used size is size 0, but I also find it very handy to have 0-4 at least. Larger sizes get more expensive, and for the techniques that I use, I find these high end brushes not as necessary because a fine point is less important to me as I apply large areas of paint. This Set of four Series 7 is a great deal, especially if you do not have any of them yet. It gets you a basic set of size 0, 1, 2, 3. I supplement this with a stockpile of size 0s, as I do so much detail painting work. I have heard many good things about Raphael Kolinsky Sable from other Series 7 users, and while I have not yet become a full convert, I do augment my supplies with some Raphels. They are cheaper, at about 65% the price of W&N and are very similar to the W&N ones, but I have noticed that they generally run a bit larger for the comparable size. I've started using Raphaels for my larger sized brushes, size 4 and larger. If you've been a longtime follower of my blog, technique books, and/or social media, you might be aware of my ongoing struggles with finding good paper. For about a decade I was using Strathmore 500 series heavyweight illustration board, but the quality of that became erratic, and so I had to find something else to work on. I use a variety of techniques, but some of the more heavily textured methods require that have a more rigid surface to work on. I also prefer hot press because the fine detail that I do needs a smooth surface. Fabriano Artistico was my preferred for about 2 years before they also changed something in their production. I'm currently trying out several options, but these are my favorites for now. Fluid Hot Press Watercolor by Global Art is the surface I enjoy the most right now for botanical art, and for pieces that don't require too heavy of a surface because the heaviest weight is 140lb (vs my preferred much thicker 300lb) Traditional style watercolor painting works very well on this surface. Pigment is vibrant on it, the paper is smooth, and very white. I like to use the 6x6 inch watercolor block for painting on the go, and the larger 22x30" loose sheets for more general painting. Even the techniques where I am applying thicker paint still work very well, as long as my sheets are taped down to avoid warping of the surface. For paintings that are highly textural (which I do with watercolor ground, see the Misc section of this page down below), I prefer something that is heavier than 140lb. If I plan to cover most or all of the surface with watercolor ground, then I still sometimes will use Strathmore 500 series heavyweight illustration board, but alternative painting surfaces include canvas (which require watercolor ground, and sanding to smooth out the cloth texture) and cradled wood panels. Arches Watercolor Hot Press Art Board is a good heavyweight paper alternative. It is mounted on thickness of matboard, so it is a very sturdy surface without requiring any watercolor ground surface-preparation. Whatever brand you chose, just be sure you go for Professional grade watercolor paints. Professional Grade generally means the pigment quality is higher and more intense than Student Grade. You will need less of it to achieve the same intensity of color, and it is worth the price increase. Aside from that, whether you chose pan or tube is a matter of preference. Myself, I like to have a very customized set of colors, and so I buy my paints as tubes and an empty watercolor palette, and create my own pan set to work from. Once my palette is dry, I can use it for months (or even years) and simply refill certain colors in the pan as I run out of them. I have several palettes for a variety of purposes -- my fantasy art, botanical art, and smaller travel kits that I can take when I'm on the roam. My current palettes are a combination of a few brands. Winsor & Newton was the brand I started with and still use for most of my basic colors. I was a big fan of the natural pigment line that Kremer Pigments had for a while, but those became discontinued. Daniel Smith is my watercolor brand of choice at the moment, and what I am gradually replacing many of my W&N colors with. I particularly enjoy the Primatek line of colors that DS has, many of which create beautiful granulation textures. If you have never tried Daniel Smith watercolors before, a very good place to start is with the Daniel Smith Watercolor 238 Dot Color Chart that gives you a taste sampling of their entire line of 238 colors. As far as writing & sketching tools go, JetPens! I get nearly all my pens, brushpens, pencils and erasers from that website. An often used tool that you see in my technique books, blog, as well as in the in-progress photos I post in social media, are white gel pens. My preferred is Uni-Ball UM 153 Signo Broad Point Gel Pen They are wonderfully opaque, and I do not have tip-clogging problems with them as I have had with numerous other brands I have tried out. If you missed my articles regarding techniques with white gel-pen, you can find it at my blog. 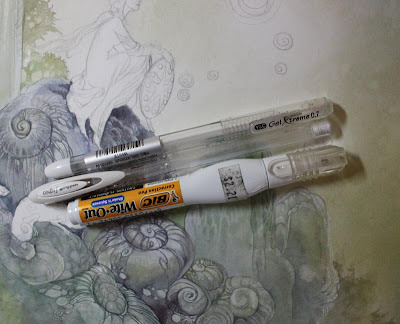 When I am after a finer point however, or something slightly less opaque, its smaller cousin works very well, the Uni-ball Signo Angelic white gel pen. Brushpens! I don't use them in conjunction with my painting, but they are one of my favorites for sketching and drawing with. I prefer brushpens over a regular pen partially because I'm generally pretty comfotable with a brush, but more than that a brush can be much more expressive than a pen can because the thickness of your line can be varied. 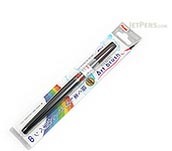 It can be used for painting in broad areas of shadow, or for very delicate linework. Pentel ArtBrush, particularly in the Sepia tone (although they come in 18 different colors) is my preferred choice. The brush tip is synthetic, however I have found that it lasts and retains its fine point for an incredible amount of time. I have yet to have to replace any of my ArtBrush pens for their brushes, which amazes me because I have never found this to be true of synthetic tipped paintbrushes. The ink is also refillable. For a splurge, the Kuretake No 50 is just a beautiful writing/drawing brushpen instrument, and a pleasure to use. Daniel Smith Watercolor Ground is one of my favorite extras to play with. If you haven't read my article, I had a whole blog post dedicated to the subject of ways to use this versatile medium, from painting on unconventional watercolor surfaces, to creating relief textures to paint on. It comes in Titanium White, Transparent, and Black (although I have no idea what use you would put a black watercolor base to). Transparent is very handy for using on those aforementioned "unconventional surfaces", like wood, or metal. Take care to apply it in thinner layers however, because if too much is applied at once, it takes on a milky translucent quality instead. Metal leaf is another component I use quite a bit of in my work. There are a few different kinds. First there's 24 K Genuine Gold Leaf. This is the most expensive. I usually get mine at L.A. Gold Leaf. A 3x3" booklet of 25 leaf sheets runs about $50.00, so it's not as horrendous as you would fear, unless you planned to be liberally encasing something in gold. You can choose to have it on a transfer sheet of tissue paper, or just completely loose. I prefer transfer because it is so delicate that it breaks easily and sticks to anything, even before you apply any sizing. 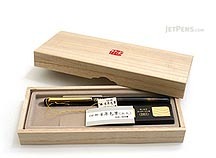 Then there is Imitation Gold Leaf , which as expected, is much cheaper. It is usually copper alloy that looks golden (or other metallic tones). Sheets tend to be thicker than 24k, less fragile, and harder to stick to surfaces. It is not very good for delicate detailed bits of leafing, but can be useful in other scenarios or for laying in large underlayers. If you have never used gold leaf, and want to try something more affordable to practice with, it is also a better option to experiment with. 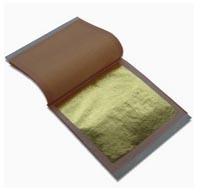 Gold leaf sizing is what is used to affix the gold leaf to the surface. 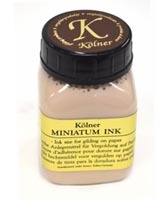 While Speedball and Mona Lisa brands work perfectly well for less delicate areas, when I want to have more control over fine lines of gilding or very small areas, I use Kolner Miniatum Ink for Gilding. It is much more expensive than the other brands, but it is smooth enough that it can be applied using a crow quill pen nib. This means that a very high level of control can be achieved over the application. For original art, signed books, artist prints, and more artwork of Stephanie Law, visit Shadowscapes.